McDSP have announced their new EC-300 Echo Collection plug-in at NAMM 2017. 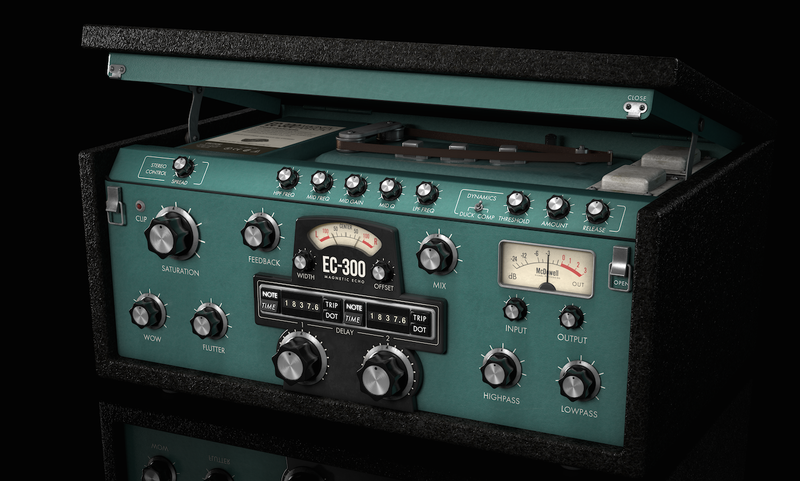 The EC-300 brings the sound of dozens of echo and chorus effects into a single plug-in. The three delay types – Magnetic, Digital, and Analog – come with an appropriate range of user controls, character modes, visual feedback, and McDSP’s nearly two decades of gear modeling experience. Each EC-300 delay type comes with additional character modes designed to help you to create new and unique sounds. Other delay features include adjustable saturation, wow and flutter, delay output ducking, in-loop filtering and EQ, and level control at the input and output stages. The EC-300 can operate in single, dual, and ping-pong modes, and delay time can be synced to session playback or to a tapped tempo. The EC-300 HD will support AAX DSP/Native, AU, and VST while the EC-300 Native will support AAX Native, AU and VST. The EC-300 Echo Collection will be released in March 2017.